Gordon Ramsay is a Scottish chef, television personality and restaurateur. He has been awarded 12 Michelin stars. Ramsay is known for presenting TV programmes about competitive cookery and food, such as the British series Hell's Kitchen, The F Word, Ramsay's Best Restaurant, and Ramsay's Kitchen Nightmares, along with the American versions of Hell's Kitchen, Kitchen Nightmares, and MasterChef. Ramsay was born in Johnstone, Renfrewshire, Scotland, and raised in Stratford-upon-Avon, England from the age of 5. Ramsay is the second of four children; he has an older sister, Diane, a younger brother, Ronnie, and a younger sister, Yvonne. Ramsay's father Gordon (died 1997) was, at various times, a swimming pool manager, a welder, and a shopkeeper; his mother, Helen Cosgrove, and Yvonne have been nurses. Ramsay has described his early life as "hopelessly itinerant", as his family moved constantly due to the aspirations and failures of his father, who was violent. In 1976, they finally settled in Stratford-upon-Avon where he grew up in the Bishopton area of the town. In past public interviews, Ramsay has declined to describe his father as an alcoholic; however, his autobiography, Humble Pie, describes his early life as being marked by abuse and neglect from this "hard-drinking womaniser". At the age of 16, Ramsay moved out of the family house into a flat in Banbury. Gordon's first years in the kitchen were spent training under culinary luminaries such as Marco Pierre White and Albert Roux in London, after which he moved to France to work in the kitchens of Guy Savoy and Joël Robuchon for three years, where he was able to enhance his expertise in classic French cooking. In 1993 Gordon became chef of the newly opened Aubergine and within three years the restaurant was awarded two Michelin stars. In 1998, at the age of 31, Gordon set up his first wholly owned restaurant, Gordon Ramsay, in Chelsea which was awarded three Michelin stars within three years of its launch. Over the next five years Gordon and his team launched some of London's most high profile restaurants including Gordon Ramsay at Claridge's, Pétrus at The Berkeley, The Grill Room and MENU at The Connaught and The Savoy Grill. 2003 saw the launch of Gordon's first international restaurant, Verre, located in the Dubai Hilton Creek Hotel. Gordon Ramsay Holdings now operate a number of restaurants across the globe in New York, LA, Tokyo, Dublin, Doha, Paris, Tuscany, Sardinia and Melbourne. Between 2004 and 2010 Gordon Ramsay Holdings launched a number of successful restaurants in London including maze and maze Grill, Plane Food at Heathrow T5, Murano, York & Albany and The Narrow in Limehouse. One of only four chefs in the UK to maintain three Michelin Stars, Gordon was awarded an OBE in 2006 for services to the hospitality industry. In March 2010 Pétrus reopened in Knightsbridge, and the long awaited re-launch of the iconic Savoy Grill followed later in the year, after an extensive refurbishment of the entire Savoy hotel. Summer 2011 has seen the re-launch of Laurier Gordon Ramsay in Montreal, and in September 2011 Bread Street Kitchen will open at the One New Change development in the City of London. 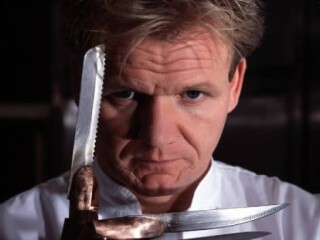 Gordon has also become a star of the small screen both in the UK and internationally with shows such as Ramsay's Kitchen Nightmares, The F Word, Hell's Kitchen USA and Ramsay's Best Restaurants and Christmas with Gordon in the UK. Gordon has also published a number of hugely successful books including his autobiography, Humble Pie, which became a bestseller. Gordon and his family live in Wandsworth in South London with their two Bulldogs, Rumpole and Romeo. View the full website biography of Gordon Ramsay.